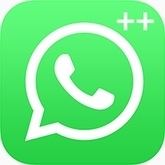 WhatsApp++ is a tweak for your favorite messenger, which brings the hottest secret features to reality! Go stealth! Hide your Last Seen and Online status from others. Updated at: March 7, 2019, 10:40 a.m.